The 747-8. Some say it’s a commercial failure, while some say it was merely intended to take orders away from the A380 and serve as the last hurrah of the 747 family. Whatever you believe, you can’t deny it’s one beautiful airplane! 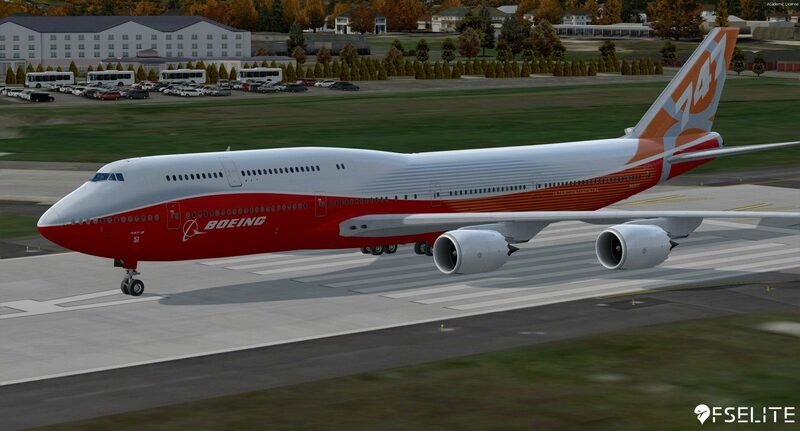 The 747-8, (not the 747-800), is the latest and greatest aircraft in the 747 family. The ‘-8’ got its moniker mainly from the 787-8, from which it shares a lot of design techniques with. Boeing redesigned the wing to increase efficiency while reducing drag, fitted brand new and extremely efficient GENx engines, stretched the fuselage, updated the avionics suite, as well as reworked and optimized countless systems to make the airplane that much more efficient and reliable over her older sister. 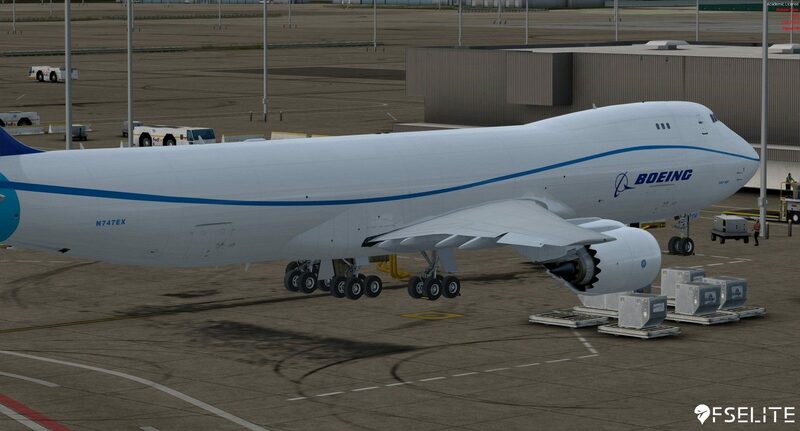 When PMDG first announced their 747 Queen of the Skies II package back in 2014, it was also announced that they would be redoing the 747-8. In doing so, this aimed to bring it up to, if not exceeding, the standard of their recently released, at the time, 777. Previously, the -8 had just been the regular 747 with a new external model; not this time, though. 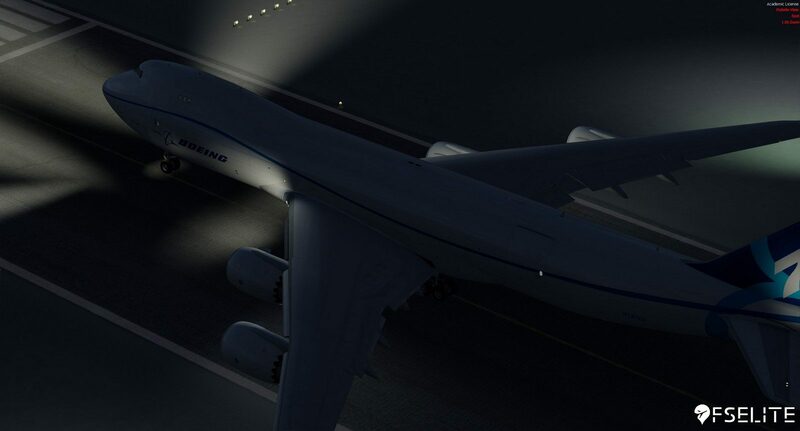 While the 747 base package was released back in January of 2017, the -8 was only just released as of a few weeks ago and said to be nearly a year behind schedule. At the surface, you’d be forgiven to think that the -8 is just a stretched -400 with new avionics, engines, and wings. But, when you really start to dig deep, you’ll notice just how different the aircraft really is compared to her predecessor. 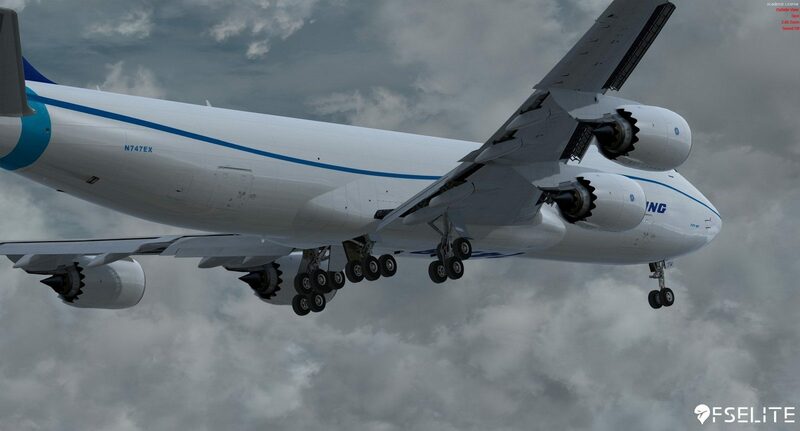 The -8 is an extremely data-driven airplane, much like the 787, and thus required an extensive rework of the base 747-400 package in order for the -8 to be an expansion in the first place. When I say data-driven, I mean data-driven. 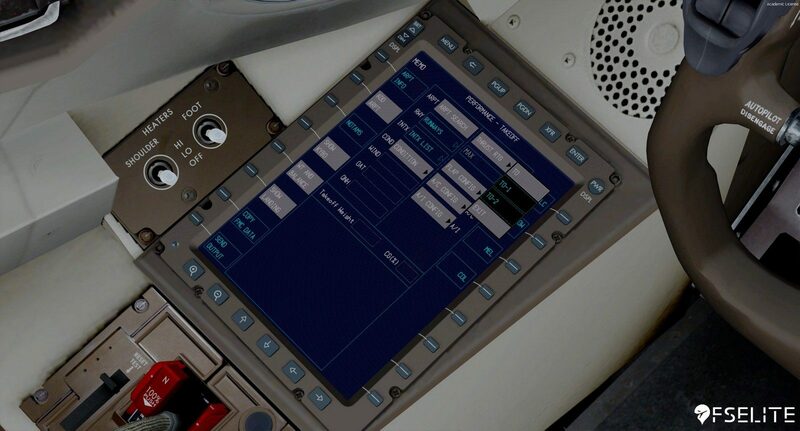 The -8 features an electronic checklist, much like the 777, as well as a new EFB and VSI monitoring. Along with all the new tech, this adds up to almost a completely new airplane. And in my time thus far with the -8, it really shows. 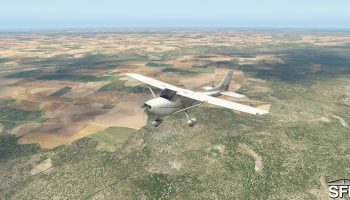 With PMDG’s widely regarded reputation as one of the best flight sim addon developers does the -8 live up to the hype? Download and installation is the usual PMDG deal; painless and logical. The download link can be found in your PMDG marketplace account, and a few clicks later you’re off to the races. 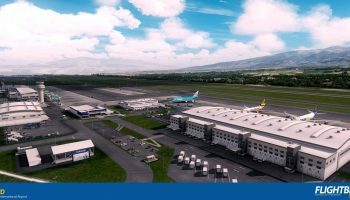 Once the installation is completed, you’ll find yourself in PMDG’s Operations Center. Here, you’re able to update your products when new updates are released via the micro-updater, as well as download, manage and install liveries. Speaking of liveries, there are a lot of them. In my counting, I was able to find just over 40 in total. Many know the tale of how the 747-8 was sort of a, well, failure in the real world, with only 3 passenger airlines flying them. 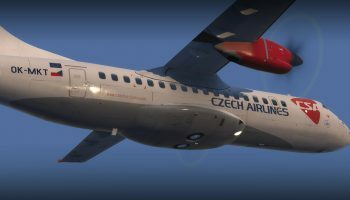 PMDG could’ve taken the easy way out and only recreated liveries for the airlines that fly the airplane in real life, and thus shed the burden of the “fictional” paints to the community, but they didn’t. For the most part, if an airline flies, or flew, the 747-400 at one point, you’ll find a -8 livery in its scheme. 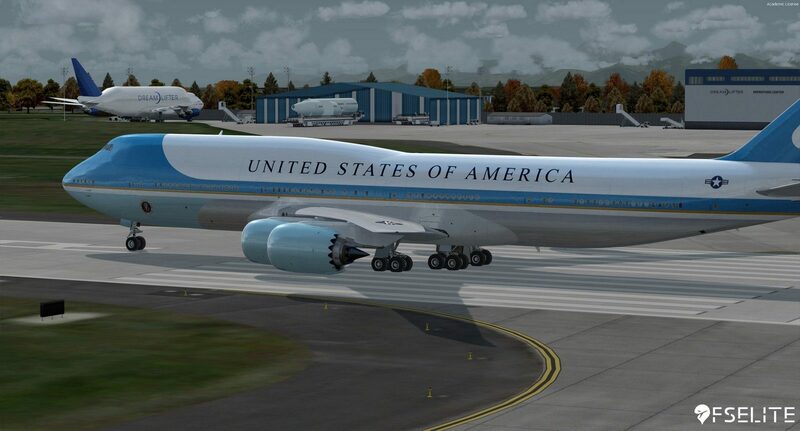 An Air Force One paint is also available for those looking to recreate those presidential flights out of Andrews, in addition to 2 Boeing house liveries including the Experimental Freighter and the Sunrise livery. Upon firing up your sim with the -8 for the first time, you’ll be prompted to input your activation key in order to register the product. 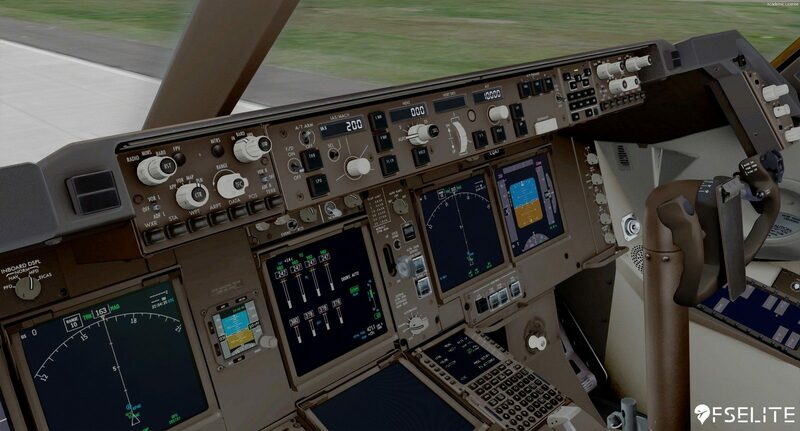 Once registration is successful, you’ll find yourself in the cockpit of the new PMDG 747-8. And what a sight it is. One of the first things you’ll notice right off the bat is how clean the aircraft looks. Gone are the scuffs in the leather, the worn down switches and textures that made the 747-400 truly feel used. 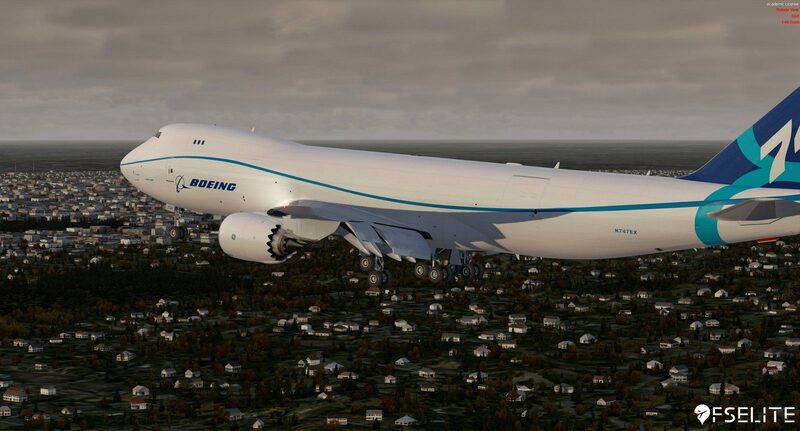 PMDG elected to model the aircraft after one of the newest 747-8s in service. Everything just looks pristine. You’ll also notice the two EFBs tucked away beside the captain and FO’s seat as well as the aforementioned Electronic Checklist once the aircraft is powered up and the checklist button on the MCP selected. 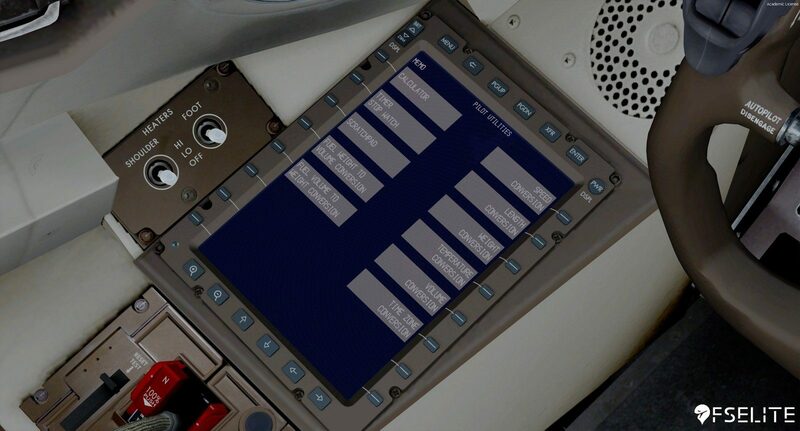 For those unfamiliar with an ECL, essentially it replaces the old school paper checklists for normal procedures, and includes checklists for nearly every dreamable failure or event, taking data directly from the onboard sensors. (Being such a highly requested addition, I’ve dedicated an entire section to the EFB below). 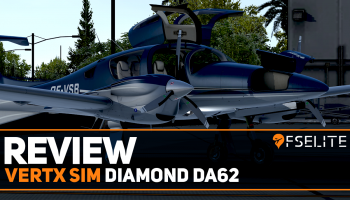 Texturing and modelling of the aircraft is as high quality as you’d expect from a high-end addon these days. 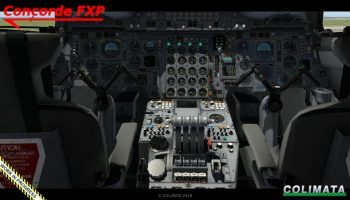 I found the cockpit textures to be crisp and sharp, with little highlights for me, personally, being the brand new look throughout the flight deck, a stark contrast to the aged -400. The exterior is no different, with the modelling quality really showing on the gorgeous chevrons of the GEnx engine. Everything just feels high-end in this department, though I feel that a bit higher resolution external textures would have been a nice addition. Sounds are another area I’d like to touch on. The spool up sounds exactly like the real engines from what I was able to gather, and the sounds at TOGA are just as convincing; I know this may sound silly, but the engines as a whole just sound efficient and modern, like they were originally designed to be. The sounds in the cockpit are just as nice, with some of my favorites being the avionic fans as they first spool up. Of course, like the 747 and 777 before it, no 2 button clicks will sound exactly the same, like in the real world as every actuation of a switch sounds different from the last. 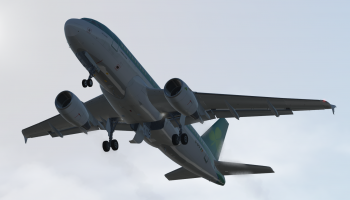 Sounds can really make or break an aircraft, and I’m pleased to say that they are just phenomenal. 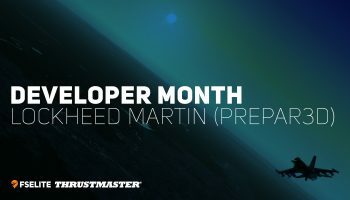 PMDG is known for releasing their aircraft with a plethora of documentation, ranging from the real FCOM and QRH to various tutorials and quick start guides. The -8 is no different, for the most part, with both the 747-8 specific FCOM and QRH being included. There was a stark lack of a specific tutorial for the type, understandable since the transition from the -400 to the -8 is seamless in the real world after a few days of differences class, but is nonetheless all the more daunting for those who wouldn’t consider themselves fit to fly the new kid on the block yet without help from YouTube or the FCOM. 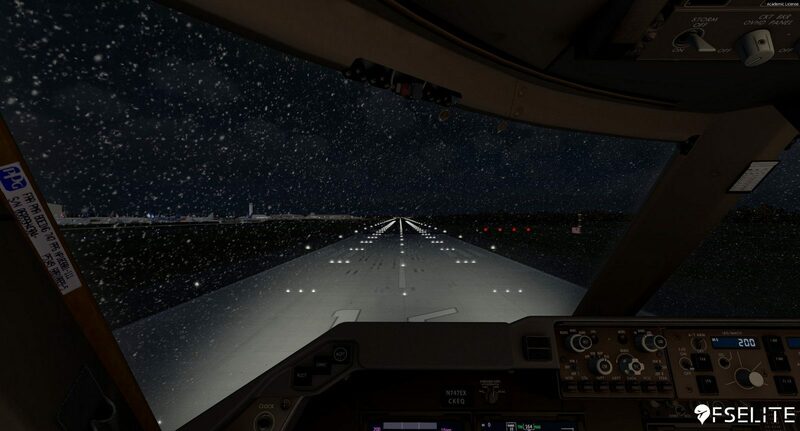 One of the most sought-after additions to any virtual aircraft has always been an Electronic Flight Bag (EFB). One of the main features of an EFB is to be able to view charts and calculate performance. Previous attempts from other developers have resulted in half-baked attempts, with missing functionality or features that lacked polish. 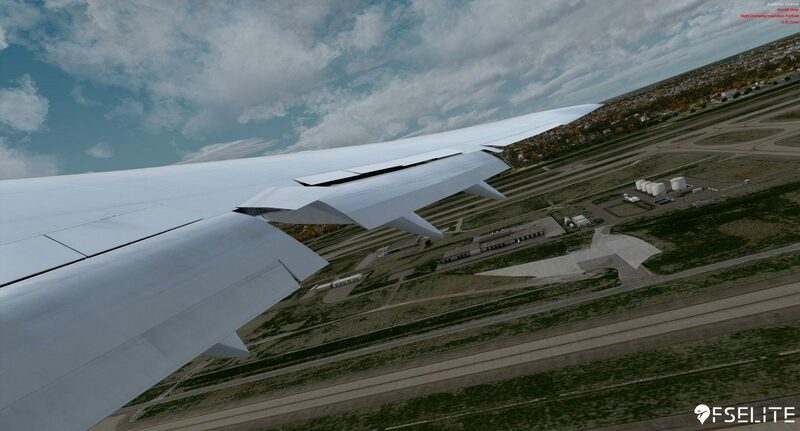 PMDG, however, decided to do the incredibly useful tool justice in their 747-8. 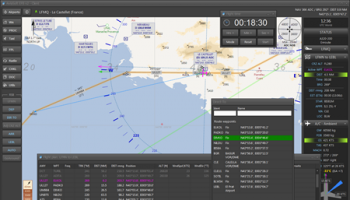 For chart integration, PMDG opted to go with Navigraph Charts as the provider. 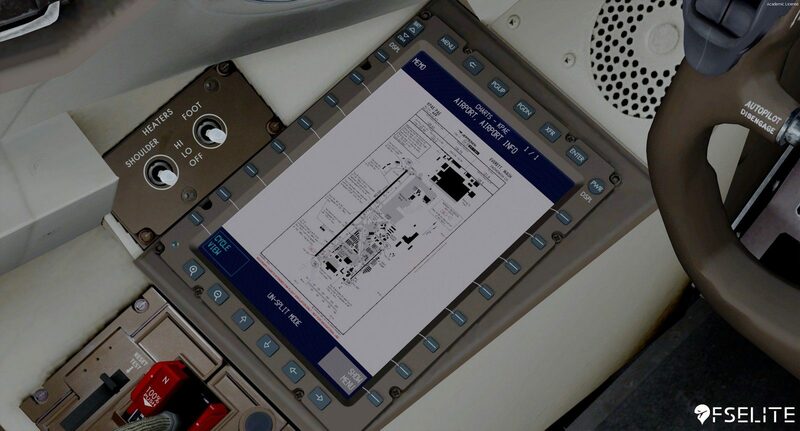 This means any chart in their catalogue can ‘automagically’ be viewed through the EFB, or on the ND display itself; the charts included are high resolution, even on the tiny screen, and are the same as those you’re able to find in Navigraph’s standalone Charts application. It should be noted, however, that one needs a Navigraph Charts subscription to be able to use this feature, leaving users of Aerosoft’s NavDataPro seemingly out of luck at this time. 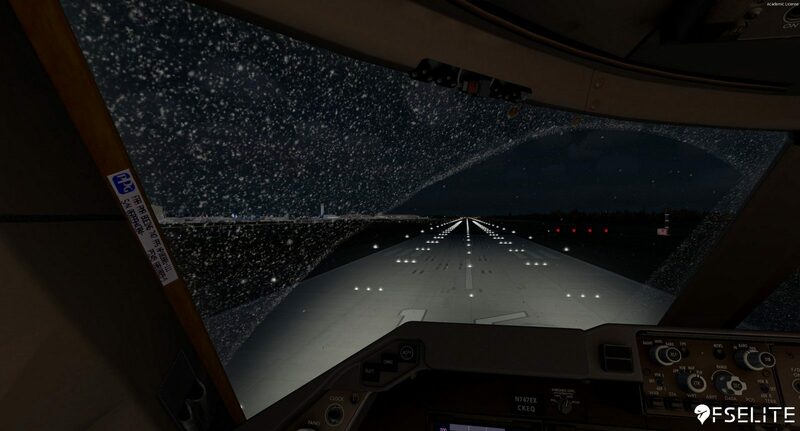 Both light and dark versions of the charts are available, which will please those who fly mainly at night and don’t want to be blinded when they go to check the arrival procedures. On the topic of the charts and their implementation, I have a few gripes to address here. 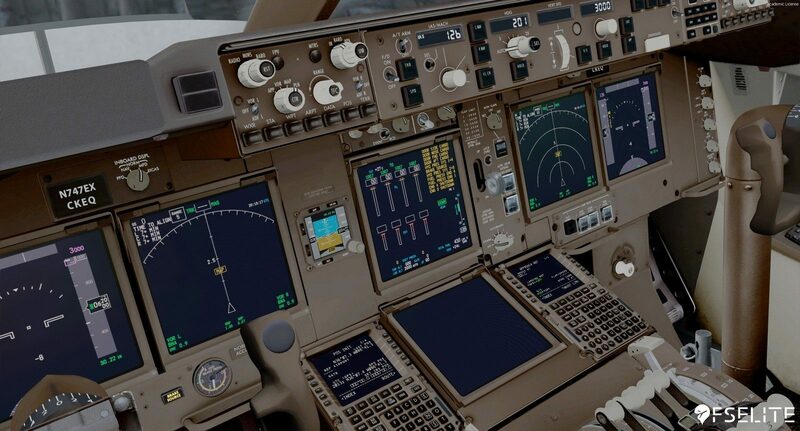 While accessing them is as easy as a few clicks through the EFB, actually using them is a different story. The EFB’s screen is so tiny, and awkwardly placed (almost by one’s knees), actual usability of the charts are close to nonexistent. I’ll be blunt here when I say that I never really saw the value in charts implementation due to these exact reasons, and I really see no point in using the EFB’s charts over those found in the standalone app from Navigraph. 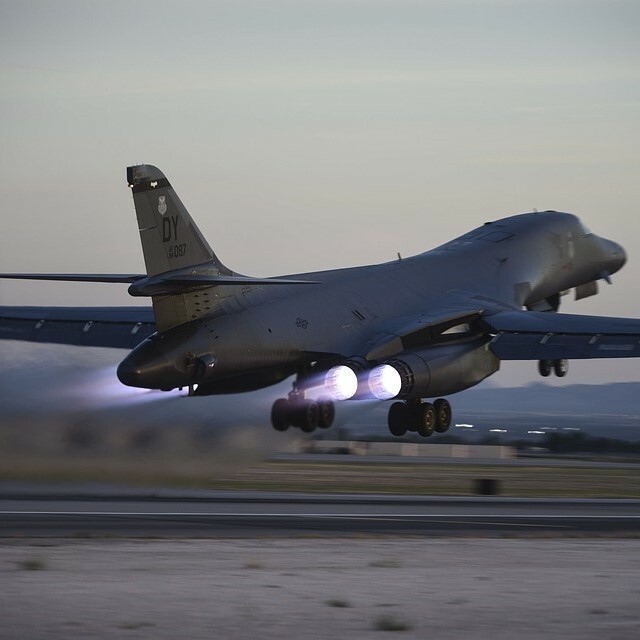 A commonly noted reason for users desiring an EFB is performance calculations. These calculations allow you to determine the optimum engine derate setting, reducing fuel burn, noise as well as wear and tear on the engine. Previously, one had to use a program such as TOPCAT or TOPER in order to perform these calculations, so I was pleased to hear that they would be included in the EFB. 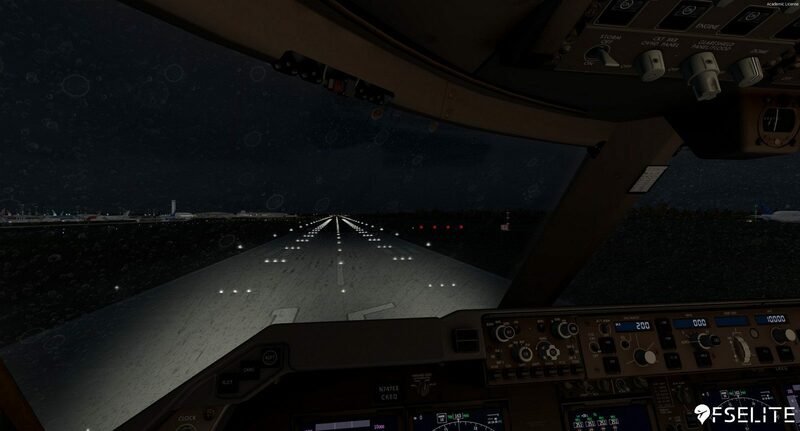 Unfortunately, while the base calculations such as takeoff distance required are available, calculations to determine optimum derates are greyed out, with the infamous ‘coming soon’ moniker showing when you try to click the button. Currently, only calculations for full TO thrust is included, with derated calculations such as TO-1 and TO-2 unable to be selected. 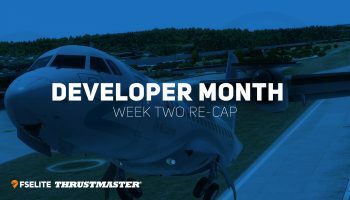 In addition to this, the EFB mentions that the functionality will be implemented at a later date, while posts from PMDG on the Avsim forums, notably RSR (Robert Randazzo), cite the incredulous data costs for it not being implemented. For such a crucial feature, it was disappointing to see it left out. The -8 features a fly-by-wire roll axis as well as spoilers. When compared to flying the 747-400, the -8 feels much tamer. Now, I’ve obviously never flown a real 747-8, nor do I know anyone who has, but it truly feels like a modern, more sophisticated 747; and that’s exactly how it was designed to be, to allow crews to be able to fly both with very little difference training. One of the notable features of the aforementioned fly-by-wire roll axis is that it controls aileron droop. When Boeing was in preliminary flight testing for the 747-8, they noticed a bit of flutter in the wings under certain conditions. Rather than redesign a large section of the wing, or potentially the entirety of the wing itself, Boeing implemented aileron droop to cancel out this flutter. 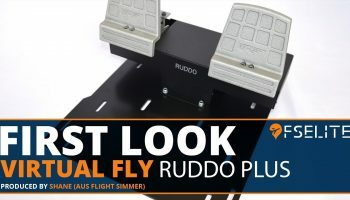 This droop can be observed on both the inboard and outboard ailerons at low speeds, within the flaps 10-30 or the flaps 10-20 range, respectively. Seeing this modelled is, subjectively, extremely cool, and something that could’ve easily been “missed” in favor of less development work. 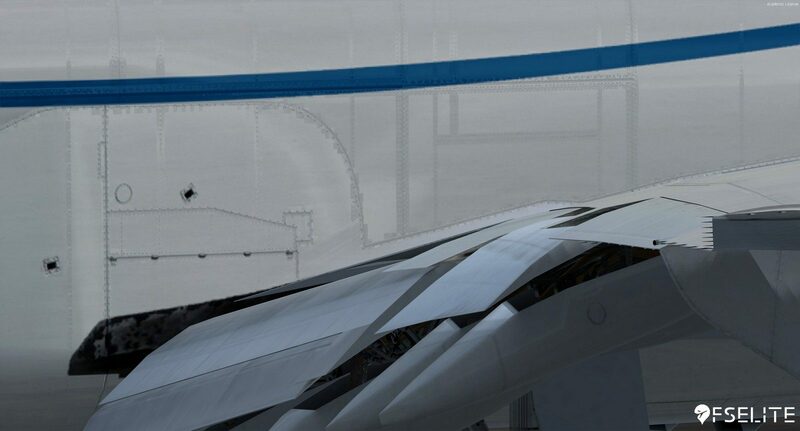 Debuting with the 747-400 QOTSII, as well as being featured in the -8, is physics based wing flex. 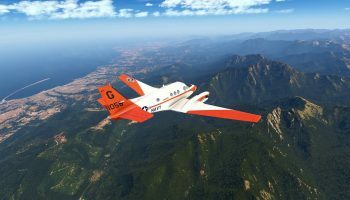 Wing flex is one of those hot topics in the flight sim community, much like politics, with varying opinions from totally useless to essential. 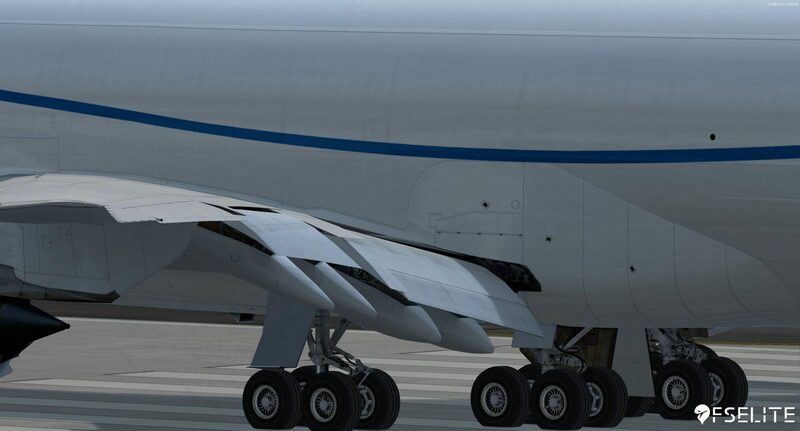 In the PMDG 747 series, the amount of fuel in the wings will dictate how much they droop while on the ground, as well as how much they flex upon rotation and load changes in flight. 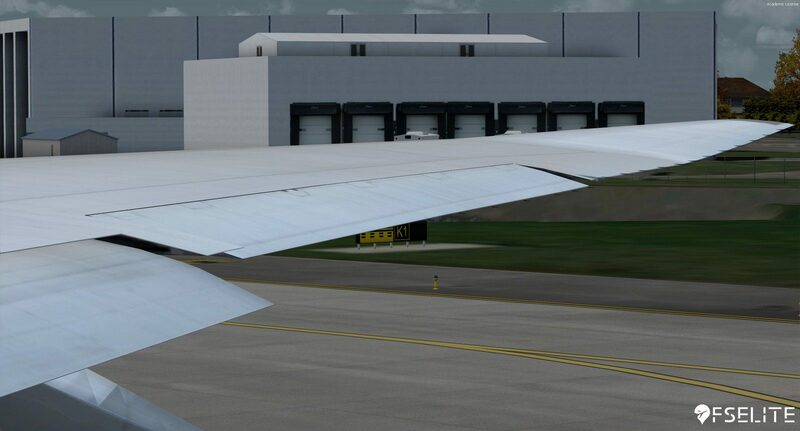 Overall, I haven’t seen a better recreation of wing flex in any sim aircraft before, and it’s certainly a sight to behold! As a whole, the -8 flies exactly how you’d expect a massive, 4-engine aircraft to fly; heavy on the controls in some stages of flight while extremely nimble in others. When flying close to that 987,000-pound max takeoff weight, don’t expect much in the climb rate department, and descents should be carefully planned to avoid barreling down an ILS doing 220 knots. It certainly doesn’t stop on a dime at heavy weights, so descent energy should be on the forefront of your mind when shooting approaches into treacherous airports. Another highly requested feature in the PMDG lineup was visible rain effects. 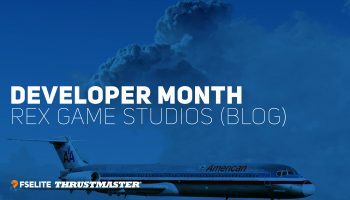 Up until P3D v4, we had been told that it hasn’t been possible due to the immense resource drain it brings, thus we haven’t seen it in any PMDG product (except the JS41 for FSX). I found the rain effects to be gorgeous, and the interaction with the wipers is just as nice. As speed increases, the need for wipers will diminish until there will be no rain even visible due to the airflow pushing it off the windscreen. The snow effects are beautiful as well, with visible snow buildup dependent on whether or not window heat is on. An interesting thing I noticed while testing the window heat functionality with RainMaker is how dynamic it is. When one window heat is on, you’ll notice a stark lack of accumulation, whereas snow and rain will build on an unheated window. Along with Rainmaker came the inclusion of bug splats on the windscreen. These bugs are modeled seasonally, so you won’t find many, if any, in winter, though you’ll be wishing you didn’t in summer when they are plentiful. The effect itself is quite nice, and surprisingly immersive when you get a bug splat right before touchdown. 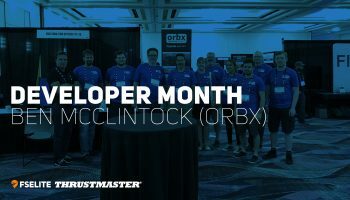 PMDG is almost hailed by some for including a mound of triggerable failures in their products, and the -8 is, shocker, the same. Nearly anything you can think of is ‘failable’, ranging from stuck outboard gear all the way to a failure of an electrical bus or an individual hydraulic system. The electronic checklist I touched on earlier makes managing these failures inflight manageable (just) and is something I had a lot of fun messing around with in my time with the plane. TOGA thrust. Interestingly enough, I didn’t notice the issue anymore after I reported it. The only other small, but minor, annoyances I found were the EICAS displaying a ‘seatbelt off’ and a ‘seatbelt on’ annunciation at the same time. 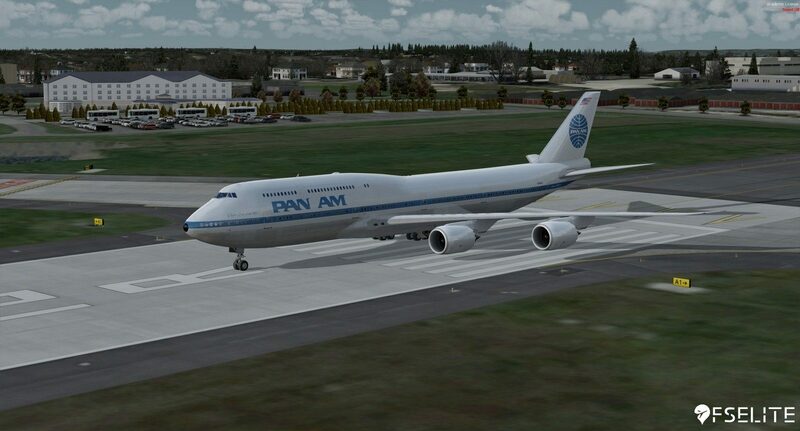 All in all, the PMDG 747-8 is an extremely stable aircraft for being so new, and rapid issuing of an update merely a week after the initial release, combined with PMDG’s track record, makes me confident any remaining, unfound by me, issues will be ironed out in the weeks to come. 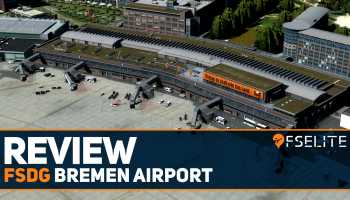 Featuring so much fancy tech like the EFB and ECL, you’d expect the performance to tank with dynamic lighting and a heavy scenery. You’d be, for the most part, wrong. 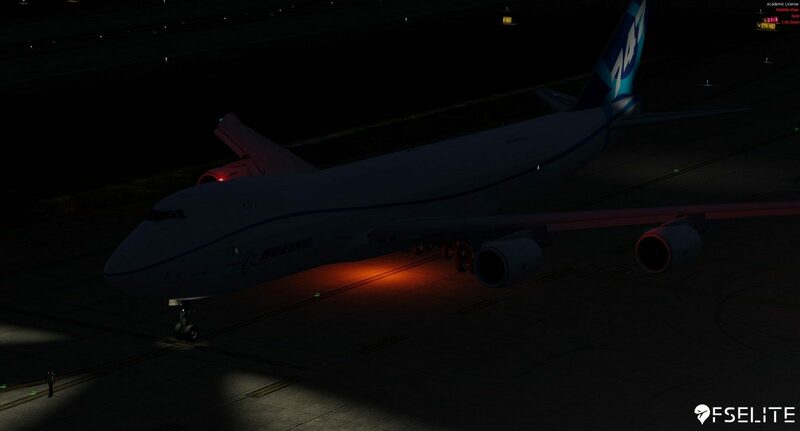 Using Prepar3D v4.3 with moderate settings on my specs (which can be found on my team page entry), performance in the -8 is nearly identical to that of the 747-400. It’s extremely close, if not just a bit better than the 777. 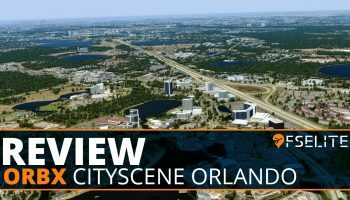 Sure, some extremely heavy sceneries at extremely high settings like FlyTampa Boston at night with AI traffic will bring the sim to a painful 10 FPS crawl, but the same will occur will occur on any rig short of the IBM Summit supercomputer. The value of an addon is always a bit of a touchy subject. 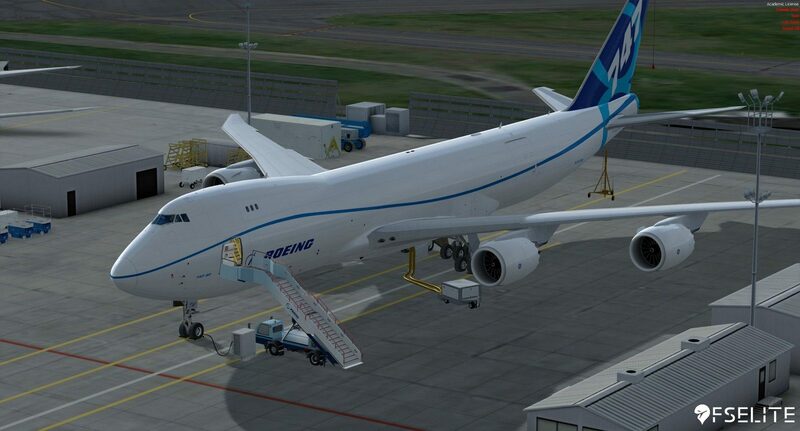 At $49.99 (FSX) or $69.99 (P3D), the 747-8 is certainly up there in terms of price. 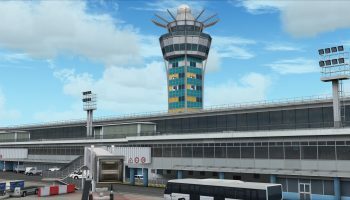 Those looking to get in from the bottom floor will end up paying nearly $150 (FSX) / $210 (P3D) dollars to get the -400 and the -8 together as you have to have the -400 base package in order to use the -8 in the first place. If you’re a freight dog who loves those UPS, Cargolux, Cathay, ABC, Atlas, Nippon or Silkway longhauls, you won’t regret it. 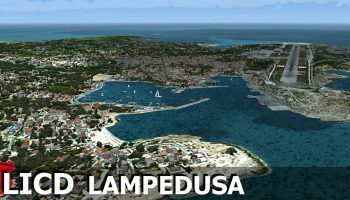 Those who like flying their virtual passengers around mirroring real-world flights will find it a bit less straightforward, with the only passenger airlines operating the -8 being Lufthansa, Korean Air, and Air China (there’s an Air Force One livery included as well if that’s your thing). 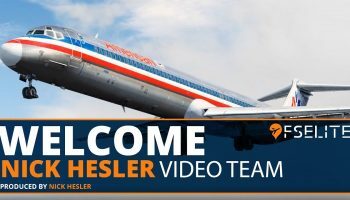 In the end, it’ll really come down to personal preference; the fictional liveries exist for nearly every passenger airline that flew the -400, so whether or not you decide to pick it up is just a matter of your commitment to the utmost realism. 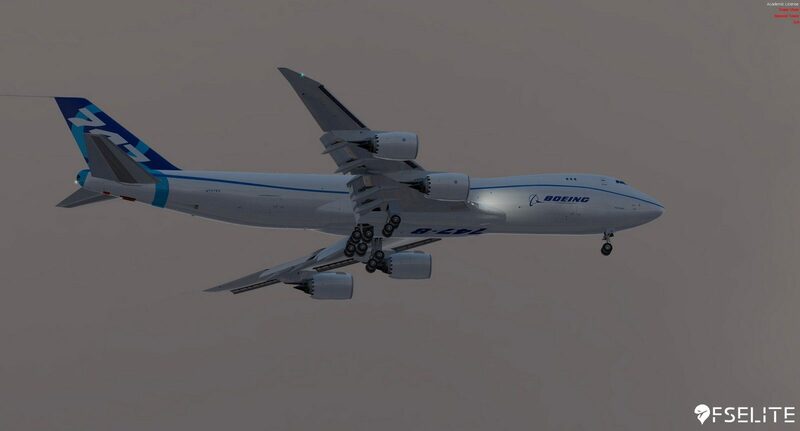 If I had to sum it all up, I’d say the PMDG 747-8 is one of the best aircraft to release in a while. 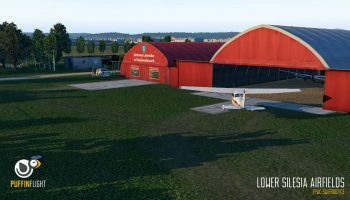 Sure, there are a few issues such as the lack of derated performance calculations and the odd bug here or there but the aircraft is extremely stable overall. 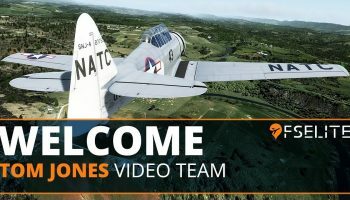 On top of the typical PMDG level simulation we come to expect, the team have packed in brand new technology to entice us to part with our money. 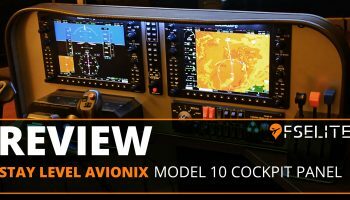 Features such as Rainmaker and the EFB are really well done, and everything from the visual modeling and sound quality continues to define the standard we should come to expect from these types of aircraft. All of this makes the 747-8 a must have in my opinion. 8.8 Out of 10 How do we score? | Feedback? 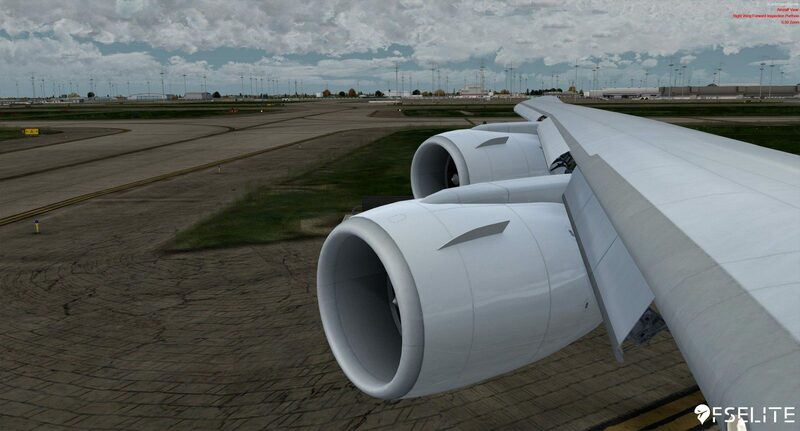 The PMDG 747-8 is truly a modern marvel of our sims. 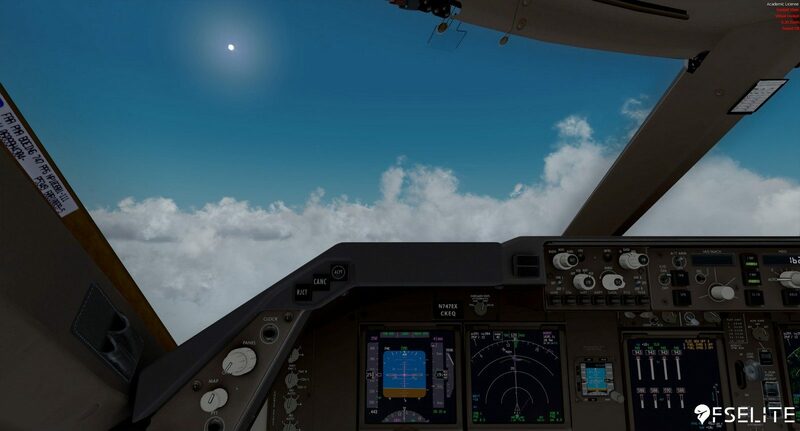 Everything you loved about PMDG's 747-400 is back and better than ever, along with some long awaited features such as the EFB and RainMaker, making the -8 a true no brainer if one already owns the -400 package.